In the middle of the comfortably furnished room, I stood still in shock. Amid the armchairs, cushions, and coffee tables of a pleasant middle-class household in central London was a white marble bust of a young woman, skilfully carved to give the effect of a veil covering the perfectly formed face beneath. Her eyes were open, but was she alive or dead? Personally, I’d have been terrified to have that bride anywhere near me, but my hostess and interviewee was the crime writer P.D. James, and I had been wondering where, in this friendly family home, might be some trace of the preoccupation a crime novelist must surely have with death. As a crime writer myself, I have reviewed and interviewed crime authors over a couple of decades for the British print daily, The Independent, now, sadly in my view, only available online, and I was delighted when Phyllis James invited me to her home. She explained that her Veiled Bride was a copy of a sculpture belonging to the Duke of Devonshire and had been created by an Italian sculptor, Raffaele Monti, in 1847. At that time, it was appealing to the Victorian Gothic taste, but I was surprised to see it in cheerful modern surroundings. However, it not only gave me an insight into the depths of feeling behind her fiction, but also justified my belief that interviews should be conducted face-to-face. Many young journalists believe they can conduct the interview by electronic media, but even Skype cannot give the sense of actually being in the room with someone, let alone their odd tastes for the macabre. Val McDermid was describing an effect of murder which I had realised when I invented my Regency detective, Lord Ambrose Malfine. In the first novel featuring him, Let There Be Blood, he has retreated from society, physically and mentally scarred from warfare. Only one thing is powerful enough to force him out of his retreat: a murder he must solve. That alone can bring him into contact with the rest of society. Another writer whose life contained a surprise was Minette Walters, who will be well-known to crime fans for, among many other successful novels, The Sculptress, about a woman imprisoned for murder. Minette is a delicately pretty lady, one would think totally unfamiliar with the inside of a prison. But, no, she told me that she had been a regular visitor to Winchester gaol. This prison, in the gracious city where Jane Austen is buried, is actually one of the toughest in Britain, where hardened murderers and rapists are confined. But Minette had long one-to-one talks with some of these men. As the only “civilian” with whom they might come into contact, they confided in her intimate details of their lives which she felt honourably bound not to use in any of her books. But, clearly, this primary contact with murderers gave her a perspective not only on victims, but on killers, for she said rather chillingly that the men in Winchester seemed perfectly ordinary on the face of it, men whom one might meet in any situation. Quite. It’s a very uncomfortable thought, but it is in some ways the job of the crime writer to think uncomfortable thoughts. And to read uncomfortable material. I spent some distressing hours reading reports of actual murders, and I can tell you there is nothing we writers could invent that is as horrible as what happens in real life. The difference is that between the covers of a detective story, the horrors can be controlled and contained. Yes, it’s our job to provide reassurance as well. Indeed, it was alive! Regularly fed and the pride of the entomology department. It seemed to me that this is what we do with history, not just with biology: We think it is safely dead and behind glass, so as to speak, but sometimes it can come alive and jump out at us. This was the germ of my story. I can honestly say I have never used any of my interviewees’ stories in my own fiction because I take great pleasure in creating problems and resolutions in narratives and creating my own atmospheres and characters. 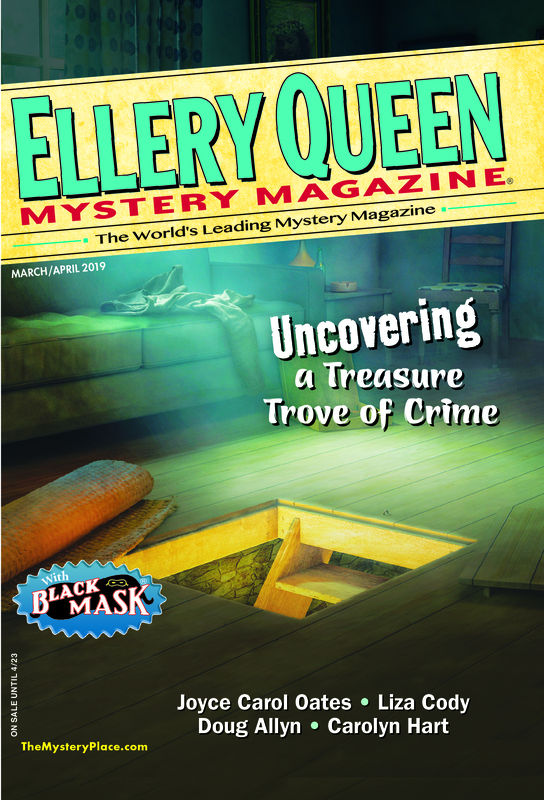 And I’m very proud of appearing in the pages of EQMM alongside so many fine practitioners of murder stories! This entry was posted in Fiction, Genre, Gothic, Guest, History, International, Readers, Story, Writers, Writing. Bookmark the permalink.